This might explain the winged emblem that graced Sonic 1's title screen. You’ve heard of Dr. Eggman being designed after Teddy Roosevelt and Sonic dating Madonna, the spitting image of the ’80s pop icon–both of many origin stories surrounding the conception and birth of the Blue Blur. 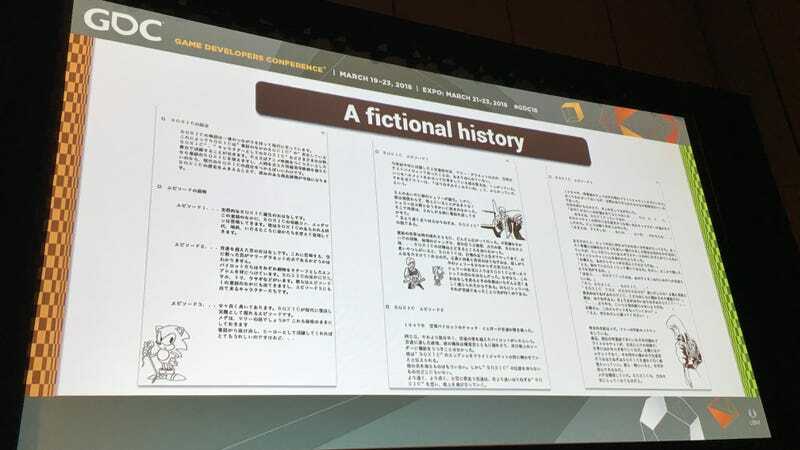 At this year’s Game Developers Conference Wednesday, game designer Hirokazu Yasuhara and beloved character designer Naoto Ohshima dropped another origins bombshell with a post-mortem containing an original backstory that’s 100 percent cooler than the lab accident where Sonic’s fur changed from brown to blue. It’s more of a story within a story. Or should I say, a children’s story within a war story? In World War II, Ohshima’s story goes, there was a pilot who earned the nickname “Hedgehog” for flying his plane at high, undetermined speeds and touching back down with his hair standing up in spikes as a result of his speed demon antics. While his comrades painted babes on their planes, his nose art depicted a hedgehog in Sonic’s likeness, as did his leather bomber jacket. After the war, the pilot married a woman who wrote and illustrated a children’s story about a hedgehog based on her daredevil husband’s nose art. The story ultimately played out in Sonic 1. The story-within-a-story concept never made the final cut, but the nose art, as well as the jacket patch, was displayed as the title logo for Sonic’s debut game.